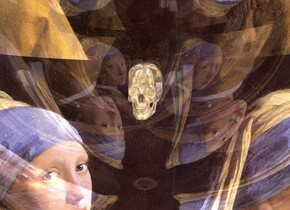 the skull is -7 feet above the 11 foot tall vermeer cube. 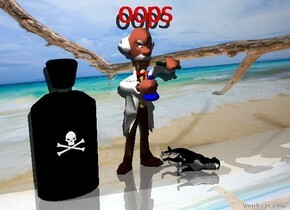 a cyan light is 1 foot above the skull. it is 4 feet left of the skull. a red light is above the cyan light. the ambient light is black. the camera light is black. there is a silver pyramid. 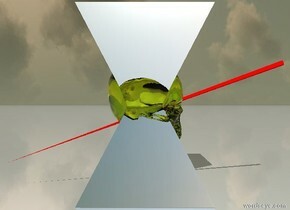 there is a clear chartreuse skull 8 inches in the silver pyramid. 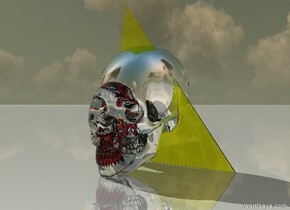 there is a 2nd silver pyramid 8 inches in the skull. it is upside down. 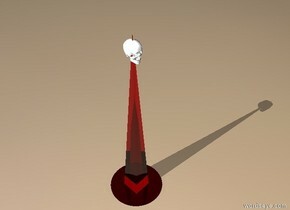 a 2.5 feet long red cone is 11 inches in the skull. it is .5 inches wide. it faces up. it leans north. the ground is shiny. 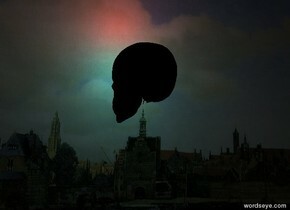 there is a clear red skull. its tooth is white. the ground is shiny. 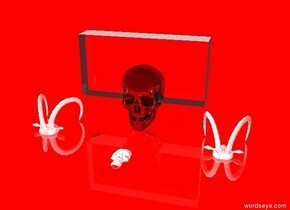 a 1.1 feet tall silver skull is -6 inches behind the clear red skull. 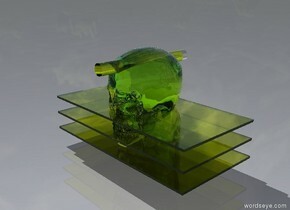 a 1.5 feet tall clear chartreuse flat pyramid is 1.1 feet in the silver skull. it leans south. the shiny tan skull is 12 inches in the athlete. it is 14 inches tall. the small rainbow is 50 feet behind the athlete. the grim reaper is next to the athlete. the tall [da vinci] desert. the 15 foot tall mirror is 3 feet in front of the athlete. it is facing the athlete. it is 5 feet in the ground. the pane of the mirror is dark blue. 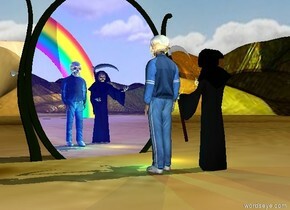 the yellow light is in front of the grim reaper. the cyan light is in front of the athlete. the athlete is in the silver arena. the 80 foot tall shiny purple cylinder is in the arena. it is 10 feet wide. 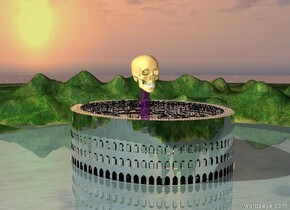 the very humongous skull is 10 feet in the cylinder. the dog is on the ground. the ground is shiny. 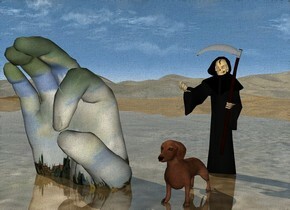 the small grim reaper is behind the dog. the enormous vermeer hand is a foot left of the dog. it is -3 feet above the dog. 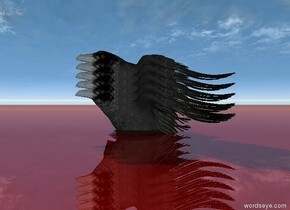 it is leaning forward. the chair. the small pig is on the chair. it is upside down. the tiny red shiny pond is to the right of the chair. the small bed is on the pond. a small sheep is 6 inches in the bed. it is facing left. it is upside down. the tiny "rocking dead" is 6 inches above the chair. 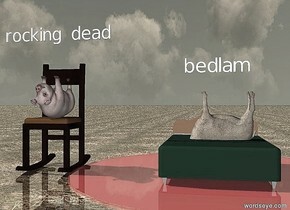 the tiny "bedlam" is 6 inches above the sheep. the ground is shiny dirt. 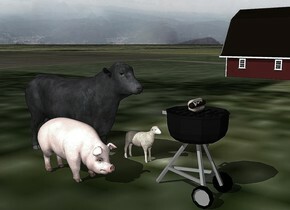 a pig, cow, and small sheep are 1 foot behind the grill. the ground is grass. it is cloudy. the small barn is 40 feet to the right of the cow. the hot dog is on the grill. the man is next to the supine dog. the ground is shiny. the small red "oops" is above the man. the [island] wall is behind the dog. the enormous bottle is 1 foot to the left of the man. the dog is leaning 50 degrees to the right. the cat is leaning 20 degrees to the left. the cat is right of the dog. the dog is in the ground. the cat is 6 inches in the ground. the ground has a sand texture. the yellow light is above the cat. it is cloudy. the spider is on the plate. the purple illuminator is 2 inches above the spider. it is cloudy. the spider has a klee texture. 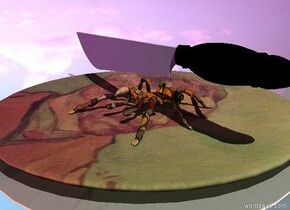 the knife is above the spider. the ground is reflective. 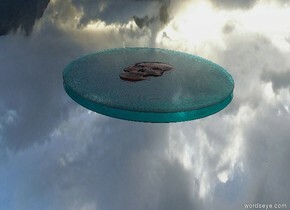 the plate has a van gogh texture. The baby is on the ground. 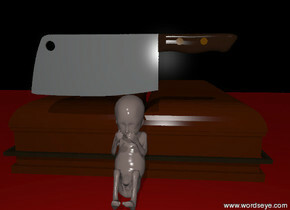 The baby has a knife. The ground is red blood. There are tiny corpses behind baby. A black brick wall is 2 feet behind the corpses. The man is 12 inches in front of the entirely silver woman. he is facing her. the woman is under the small willow tree. the ground is dirt. it is partly cloudy. The top hat is -3 inches above the woman. it is 16 inches wide. A enormous screwdriver is -2 feet behind the hat. 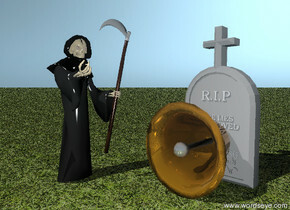 death is next to the huge bell. the bell is facing down. 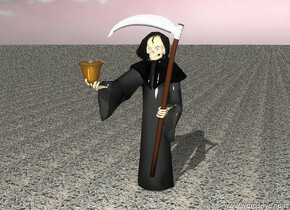 death is facing the bell. the big gravestone is two feet behind the bell. the ground is grassy. it is evening. the hair is ten inches in the businessman. the hair of the man is yellow. the lips of the man are red. the two red eyes are 1.5 inches above the lips of the man. the headskin of the man is blue. the neck of the man is blue. the ground has a checkerboard pattern. the checkerboard pattern is 8 feet wide. the red wall is 6 feet behind the man. the second red wall is to the right of the red wall. it is facing right. the large mirror is 2 feet behind the man. the large mirror is three feet to the right of the man. the large mirror is facing southwest. the sky is black. the sun is black. the cowboy is to the right of the businessman. the cowboy is in front of the businessman. the cowboy is facing left. 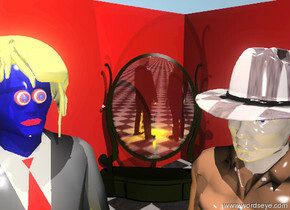 the gold illuminator is in front of the businessman. the hat of the cowboy is checkerboard. the mirror of the large mirror is glass. the silver light is 6.5 feet above the gold illuminator. the skull of the grim reaper is invisible. the jaw of the grim reaper is invisible. 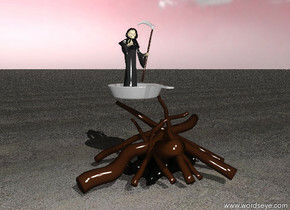 the brain is six inches below the top of the grim reaper. it is -20 inches behind the grim reaper. the sky is partly cloudy. the ground is steel. 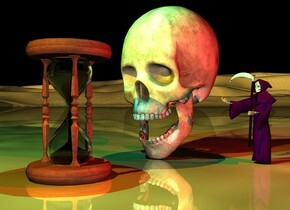 the bell is in the hand of death. it is upside down. the sky is crimson. it is partly cloudy. the ground is volcanic rock. the unreflective whiteboard is on the long cream wall. the front of the whiteboard has an image-112 texture. 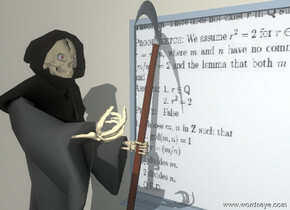 the unreflective grim reaper is -18 inches to the left of the whiteboard. 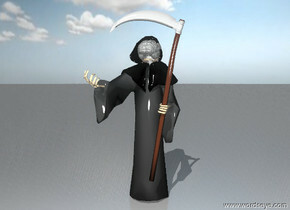 the grim reaper is facing right. the ground is tile. the fire is on the sandy ground. the sky is pink. it is partly cloudy. a large iron frying pan is over the fire. 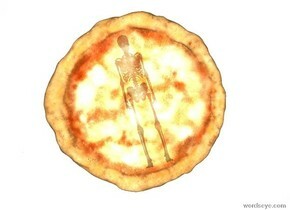 a tiny grim reaper is in the frying pan. 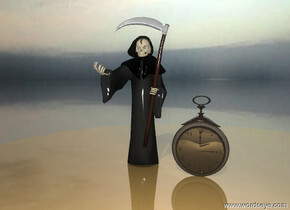 The very tiny grim reaper is next to the shiny pocket watch. the pocket watch is on the table. the table is shiny. The ground is shiny. It is cloudy. the ground is stone. the sky is chartreuse. it is partly cloudy. 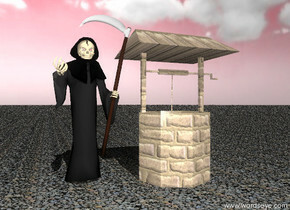 the unreflective grim reaper is standing next to a well. the well is brick. The bowl is on the plate. 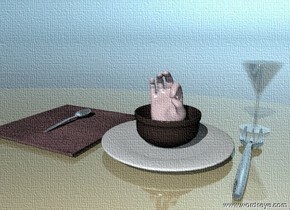 The pink hand is in the bowl. the pink napkin is to the left of the plate. the fork is to the right of the plate. the spoon is on the napkin. the plate is on the dining room table. The drinking glass is behind the fork. The table and the ground are shiny. 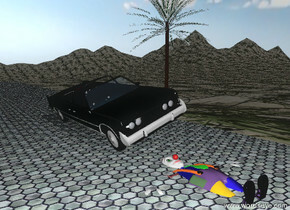 The leaning car is on the wide tile driveway. the driveway is 200 feet long. The driveway is on the tall mountain range. the mountain range has a grass texture. It is partly cloudy. The tiny palm tree is to the right of the car. The face-up clown is in the driveway. The clown is in front of the car. the gun is 5 feet above the tile ground. it is facing north. 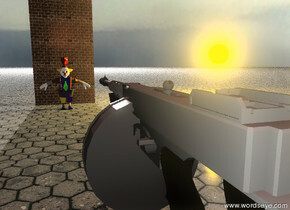 the clown is 30 feet to the north of the gun. the clown is on the ground. the clown is unreflective. the brick wall is 3 feet behind the clown. the wall is 16 feet high. the humongous white light is 200 feet behind the wall. the humongous white light is 75 feet above the ground. the big apple is on the clown. a very large orange light is 20 feet to the right of the apple. the small red illuminator is 7 feet above the back of the gun. it is morning. the sky is shiny. it is cloudy. The large red steam monster is next to the large guillotine. The guillotine is on the stone mountain range. The tall stone mountain is 20 feet behind the guillotine. The ground has a stone texture. the monster is 8 feet above the bottom of the guillotine. It is partly cloudy. 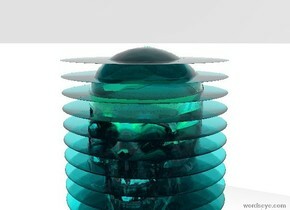 the skull is inside the glass cube. the ground is dirt. The glass cube is on the wooden block. 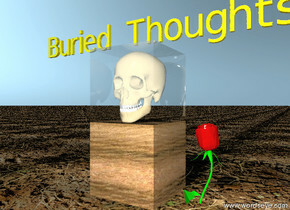 The tiny gold "Buried Thoughts" is above the cube. The large rose blossom is in the ground. It is two inches to the right of the block. 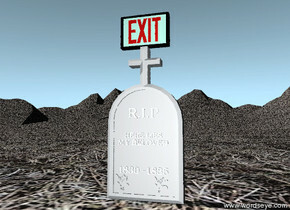 the sign is on the gravestone. the gravestone is on the extremely tall grassy mountain range. it is afternoon. the small tablet is on the piece of paper. the paper is on the table. The pen is two inches to the left of the paper. it is facing up. The chair is behind the table. The ground is tile. The small pale blue desk lamp is next to the pen. The low wide red wall is 5 feet to the left of the table. it is facing right. the very low stone wall is behind the red wall. it is very wide. The tree is behind the stone wall. The purple hedge is to the right of the red wall. it is facing right. The huge french fetus is on the chair. The small red illuminator is 6 inches above the tablet. the small green illuminator is 6 inches above the lamp. a skull. 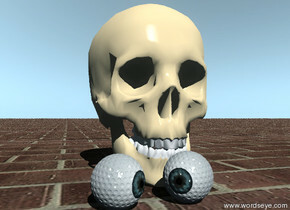 an eye golf ball is in front of the skull. the ball is facing southeast. a second eye golf ball is to the left of the first eye golf ball. it is facing southwest. 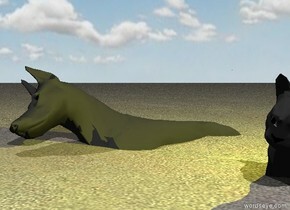 the ground is texture-img-iz1523. the sky is reflective. 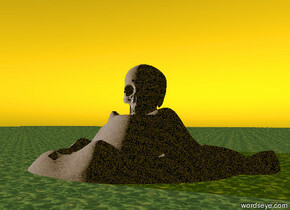 the humongous stone skull is in the stone mountain. the mountain is in the sea. it is sunset.. the sky is orange.